→eCom Hacks Academy Review – Is it Legit? Be Careful! You have probably discovered eCom Hacks Academy through a Facebook or Youtube ad, and now you are curious to know what this product is all about. Can it really help you build a successful Shopify store or is it a scam? In this review, I am going to explain everything you need to know not only about the course itself but the strategy. I am addicted to the idea of building online businesses, but some strategies are just too risky and too difficult to master. As you will see, eCom hacks Academy is a legit and an in-depth course, but there are many drawbacks. 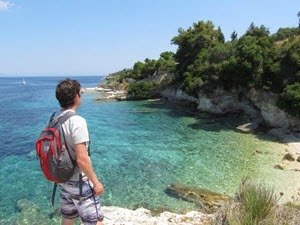 If you want to learn the proven method that helped me reach $1,000+/mo from my laptop, check out my #1 recommendation! Right of the bat we can see that eCom Hacks Academy has been featured on Entrepreneur, Inc., and CNBC, revealing a high level of trust. That is because the founder, Jared Goetz built a million-dollar Shopify store in just 60 days, generating over $5 million in sales in 2017. In this article featured at Entrepreneur.com, Jared Goetz claims to have built this site working just 30 minutes per day and shares six steps to creating your lucrative store. I am sure his achievements will motivate many people to jump into this venture and take action to achieve their goals. However, that specific article underestimates not only the amount of work required but also the risks that running such businesses entail. What is eCom Hacks Academy? ECom Hacks Academy is a step by step training by Jared, who is going to help you build a successful online store (eCommerce) using a model he created called Dropsurfing. The membership also comes with a software that automatically identifies hot products and provides done-for-you Facebook ads. Dropsurfing is similar to Dropshipping, which is the process of ordering products individually from a wholesaler and shipping directly to customers. The key difference is that Dropsurfing focuses on trending products to reduce competition. Yes, the idea is to sell ONLY viral products that sell fast. According to Jared, you will be able to make 30%-40% profit without worrying about competition. Video lessons are well-structured and high quality. There is a community (Facebook group). New trending products are added every day. It saves a lot of time trying to discover trending products. No-refund policy. All sales are final. You will have to spend money on Facebook ads. Members can compete for the same products. 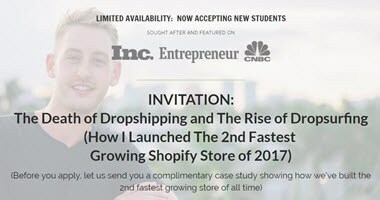 You will watch a free case study video where Jared starts by saying the traditional Dropshipping and Amazon FBA are dying, and that a new movement called Dropsurfing is rising. At the beginning of his presentation, he promises to show you how to get your store up and running in 2 hours and start making money within a week. However, that is just a marketing tactic to entice you to watch the entire video because he will not reveal the path. Instead, Jared only provides an overview of the knowledge and benefits you will gain if you purchase the eCom Hacks Academy membership. Ecom Hacks Academy is going to cover 3 main stages of building your eCommerce business. In this first step, the program is going to help you set up an online store that looks very professional in just 2 hours. You will outsource most of the work and start operating quickly. Jared has even disclosed one of his successful stores so you can have an idea of what your eCommerce business will look an excellent. ECom Hacks Academy is going to show you a new way of finding products which, according to the founder, is proven to sell lightning fast. In the beginning, I thought this was a product research strategy, but the truth is that the new way Jared is suggesting is by using a software that is included in the membership. 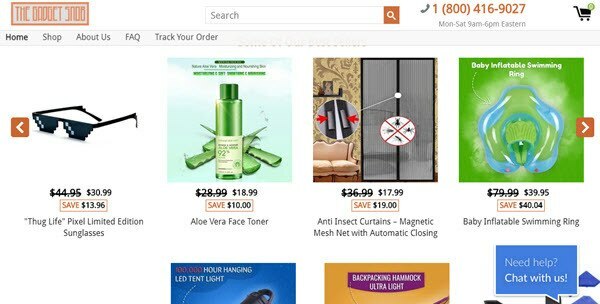 The software is called eCom Hacks Product Finder, which you can find at ehproductfinder.com. 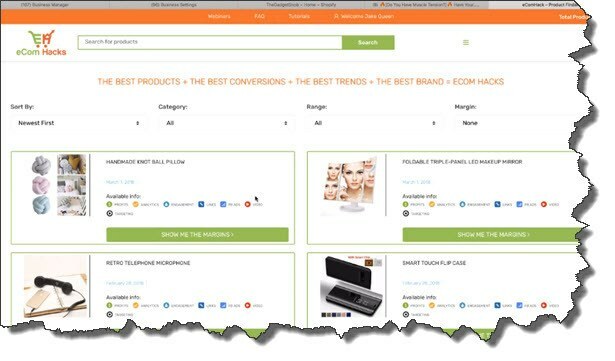 eCom Hacks Product Finder has over 500 products that have been selling like “hotcakes” on Facebook. So, all you have to do is browse the list, and choose one that you think will be more profitable. The great thing is that new products are added every single day. Product description – You can simply copy and paste it into your site. Selling price suggestion, product cost, and profit margin. Product links to suppliers such as Aliexpress, and Alibaba. Facebook targeting suggestions such as country, gender, age group, audience size, and interests. High converting videos you can use in your Facebook ads. This is a critical step because in order to maximise your profits, you will need to create advertising that stands out. According to Jared, they have a system that has been proven to convert. The system is once again done-for-you. Yup! eCom Hacks Academy will give you the exact ads you will need to create more engagement and sales. No guesswork here! If you want to go ahead, you can book a free phone call consultation that is going to last for about 45 minutes. I haven’t booked this call, but I guess it’s nothing more than a salesperson trying to convince you to buy into one of the memberships. There is no pricing information before you arrange that call, but after a quick research, I discovered there are 2 memberships that cost $997 and $1997. In my opinion, that is too expensive! Yes. eCom Hacks Academy is legit, and there is nothing wrong with teaching people how to build eCommerce stores using trending products. However, there are many drawbacks of this product and business model I would like to discuss below. The first issue is regarding the way this business opportunity is being advertised, which may give people unrealistic expectations. Jared claims that you can succeed by working just 4 hours a week, but the truth is that you will have to grind to see results. Trust me, it’s not that easy! There is a lot of research and testing to make this business profitable, especially in the beginning when you don’t have any experience. 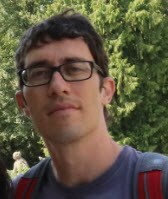 Jared claims that you will be able to use Facebook ads without wasting any money. That is such an irresponsible claim because he can’t give you any guarantees. In fact, there is a lot of risks involved in eCommerce business and most people end up wasting a lot of money because they simply can’t make enough sales to cover all the costs. 3. Competition is Still There! Another problem is that by choosing a pre-selected trending product, you will be competing with other people who had jumped in that market earlier and are already making money. Therefore, the idea of having no competition doesn’t really apply here! On the contrary, you may face lots of competition, which makes the business model no different than the traditional Dropshipping. The FAQ of the eCom Hacks Product finder says all products are well researched before you see them, and all of them are winners. Testing is the only way to make sure the product is a winner. If the targeting group hasn’t been tested using a specific ad, how can they guarantee that a product is a winner? People have the right to know the rules of the game as well as whether their privacy will be protected. Unfortunately, eCom Hacks Academy doesn’t offer a refund in any circumstances. Those who don’t like the course and think it’s worth the high price tag won’t have another option but accept the loss and move on. Personally, I would never buy such an expensive course without a money back guarantee. Although eCom hacks Academy is a legit course, I don’t think it’s a bulletproof method to build a successful eCommerce store. The business model itself is also something I would not pursue due to the risks. When you run an online store that sells physical products, you must always be looking for opportunities and spending lots of money to test advertising. If you are not an experienced marketer, you can waste a lot of money! Not to mention there all always be faulty products and shipping delays, and because you will have to deal with the customer, this business can be quite stressful. How I Make Money Online – No eCom! I almost tried dropshipping last year, but once I became aware of the risks, I decided to pull out. I had been making some good income with affiliate marketing for 2 years and decided to focus all my energy on what was already working for me. In my opinion, affiliate marketing is much better for most people because the startup costs are relatively low. Besides, you only need to care about providing helpful content. There is no need to invest in ads as you will take advantage of free organic traffic, mostly people searching on Google. So, I make money by writing content on my website and promoting products as an affiliate. When people click on my links and buy a product, I earn a nice commission. The concept is simple, but there are many things to learn and apply during the process of growing a lucrative site. If you are serious about building an online business based on the affiliate marketing model, check out my No.1 Recommendation. The owners Kyle and Carson have developed a remarkable training and community that has turned LOTS of newbies into 6-figure earners. Thanks for checking out my eCom Hacks Academy review. If you have any questions, just let me know in the comment section below. Honestly, my jaw really did open when I saw the starter price of this opportunity with Ecom Hacks. That is way too much in my opinion and I would never have had that kind of money just lying around for a venture that may or may not work. So that is a huge turn off for me as there is no need to set the price so high and I imagine that is excluding vast numbers of people in our tight economies. Hmm, I find it a shame you say that selling with your own e-store can be quite stressful. I was thinking of setting one up sometime soon. I tried selling on Facebook once, just Facebook page, and it got quite successful. Problems were many though with delays, me ringing the drivers, the company, customers ringing and texting on FB about where their product was. It was a headache but done right, even only with a FB page, I have heard of some phenomenal successes. But like you say, too stressful. So I stopped and sought online success elsewhere. I do not think I will be going with Ecom Hacks due solely on the price. That put me off of them Straight Away! Thanks Stefan for your insight in this very illuminating Ecom Hacks Review. I just checked the price again and its $47 a month. That is a bit more like it and I am assuming now that the the other figures is to pay for the whole package in one go? The coaching is actually much more expensive, starting at $997. So, pretty steep. What puts me off the eCommerce business are the shipping delays, unhappy customers, and the risk of losing money with facebook advertising. You have to accept losses in the beginning to learn the ropes. Hi Stefan, Your review about eCom Hacks Academy is pretty well, and I also agree with your final thoughts because I am also earning via writing content for my own website but still I would say the idea behind eCom Hacks Academy course is quite helpful for the beginners. Due to the lack of knowledge about online business people get frustrated and face lots of loses and failure which is damn stressful for them. Having such a course, in the beginning, can help them and guide them to run their online business in a proper way. Since it posses few drawbacks but I think every online business methods contain drawbacks. If the course is assuring you for making good income then for me its pretty good to get. Hi Sarah, I agree. I invested in an excellent educational platform to start my internet business and I am glad I did. I highly recommend a structured course to avoid unnecessary and misleading information, and eCom Hacks academy is a decent choice for those who want to learn the ECommerce business model.